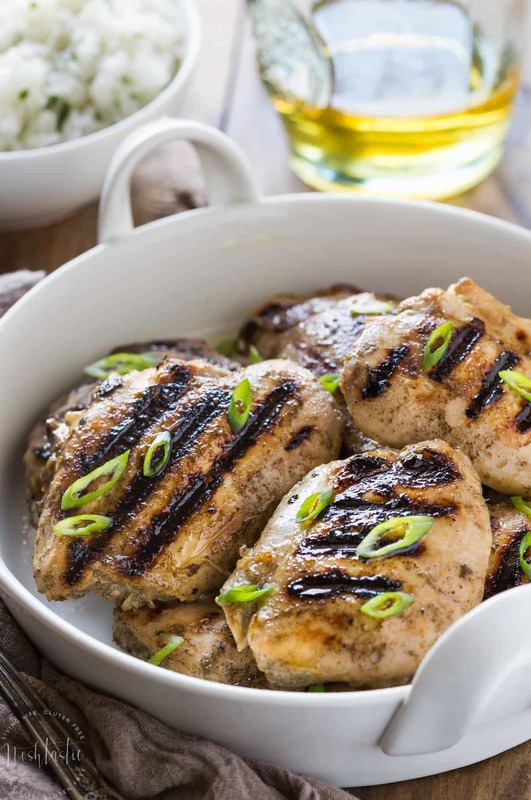 My Paleo jerk chicken recipe is very simple to prepare and packs a fabulous flavor punch!! it’s gluten free, and whole30 too! It’s really very easy to make the jerk spice rub, but first you need to assemble all the ingredients. I’ve found Allspice berries in my local grocery store, I had to grind them in a spice grinder so if you don’t have that look for it ready ground. You need a decent blender to puree the marinade well so that the onions, ginger, garlic and jalapeno peppers and all fully mixed in. Once your marinade is ready it’s best if you can leave the chicken in there for at least six hours, I have done it for less time but longer is better. If you have an outdoor grill that would be the best way to cook it, but I cooked it inside in a Cast Iron Grill Pan and it worked perfectly! Jerk cooking is a type of cooking that comes from Jamaica where the chicken, beef, pork, goat or fish is smothered in a very hot spice mixture and marinated for 12-24hrs then it’s traditionally cooked over hot charcoal in a steel drum. But that’s not all! If you are fortunate enough to visit Jamaica then you’ll find that authentic Jerk Chicken is cooked directly on top of green wood, often from the Pimento tree, which imparts some of the oils from the wood into the chicken as it cooks. ‘Jerk Huts’ are common across the Caribbean, when we visited the Cayman Islands last summer we enjoyed eating Jerk Chicken from a roadside stand, it was really delicious! What’s in an Authentic Jerk Chicken Seasoning? This is one of those tricky questions that might vary depending on who you ask! 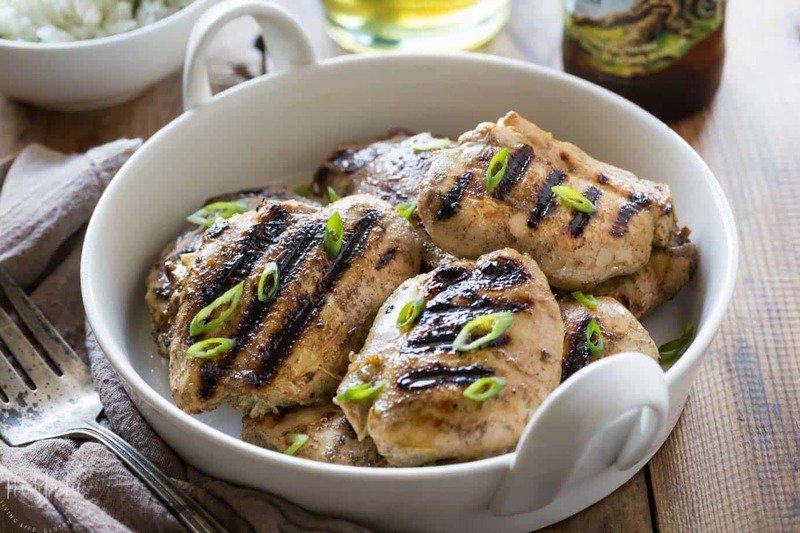 There are a couple of ingredients that are considered truly authentic if you’re going to make your own paleo jerk chicken marinade or seasoning. AllSpice berries – you really can’t omit this wonderfully fragrant spice and still have an authentic Jerk spice rub! Allspice (also known as pimento) is the backbone of the spice mixture and what makes this marinade unique. It’s not hot, but it’s very aromatic. Scotch Bonnet Chili Peppers – If you want your marinade to be the real deal Jamaican Jerk then you need Scotch Bonnet peppers, but be warned, they are HOT! They not only impart heat to the marinade but they do have a unique flavor of their own. The Jerk chicken we ate in the Cayman Islands was not made with them, and my recipe has replaced it with jalapeno peppers as none of my people would eat anything with hot peppers! 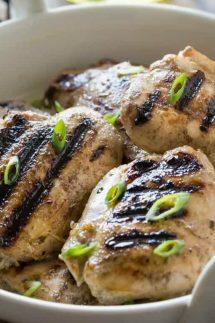 Green onions – most jerk marinades have some sort of onion in them, green onion is a good choice. Garlic – I’m not sure if this is truly ‘authentic’ but it’s a must have for me! Other ingredients vary widely but often include soy sauce, ginger, thyme and brown sugar. I replaced the sugar with honey and added a little orange juice. If you are not following the Paleo diet you can use soy sauce instead of Coconut Aminos. As I mentioned before I also replaced the traditional Scotch Bonnet Peppers with Jalapenos, it’s not as authentic but I don’t think anyone in my house would tolerate peppers that hot. 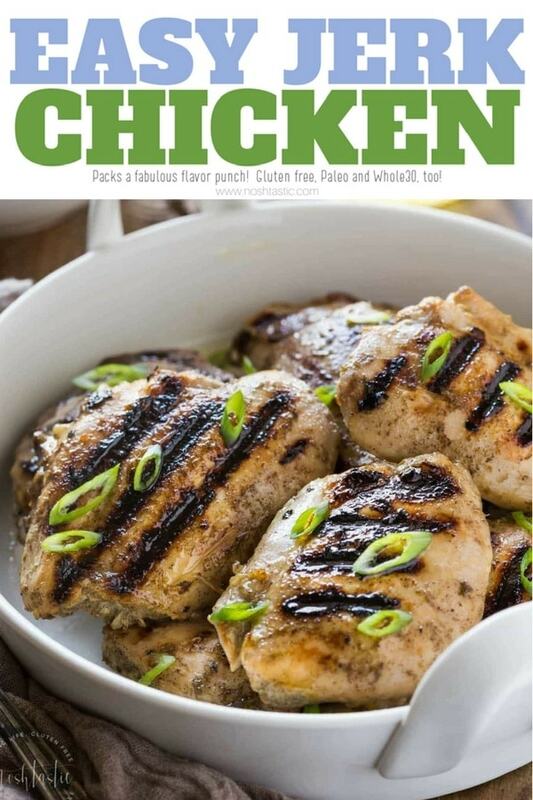 More Gluten Free Chicken Recipes! I have a lot of fabulous Gluten Free, Paleo and Whole30 recipes right here on Noshtastic so make sure you check out my recipe index before you go! One of my favorite recent recipes is my Southern Chicken Salad, it’s perfect any time of the year and is so easy to throw together. If you want something a little more substantial and comfort food style then you’ll love my White Chicken Chili recipe, it’s quick and easy to make too! And lastly, and perhaps the easiest of the lot, is my Sheet Pan Chicken with Roasted Ratatouille, it’s the whole meal baked on one sheet pan, perfect! Add all the marinade ingredients into your blender and pulse until it's all pureed. If you're NOT following the Paleo diet you can switch the coconut aminos, for gluten free soy sauce if you prefer, and if you are following whole30 omit the honey. Lay the chicken thigh in a single layer in a large dish and pour over the marinade and rub it well into the chicken, you may want to wear gloves to do this. Cover and refrigerate for at least six hours. If you remember, turn the chicken halfway through the marinate time. Cook on the stove top - I used a cast iron grill pan to cook my chicken thighs, it took about 8-10 minutes per side on a medium heat, but it depends how thick your chicken is so use a digital thermometer to check that it's cooked to 165°F. Cook in the oven - bake in an oven proof dish at 375°F for about 40-45 minutes, or until the chicken is fully cooked to 165°F. 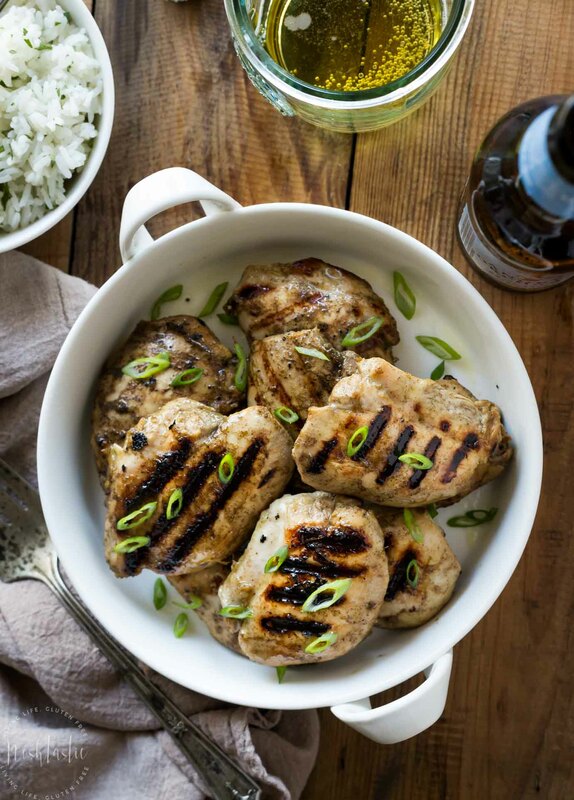 Cook on a grill - boneless chicken thighs will take about 5-7 minutes per side, a little longer for bone in. I’ve never made this from scratch only ever used a spice mix, it looks very nice and I’ think I’m going to try it!